Behind a solid effort on both sides of the ball, Georgia Tech dismantled Mississippi State and proved that it should finish the season in the Top 10. Make no mistake about it: this was the most impressive win of 2014 campaign for the Yellow Jackets. After all, Mississippi State was the No. 1 team in the country for a couple weeks, and was probably an Egg Bowl victory away from earning a spot in the College Football Playoff. 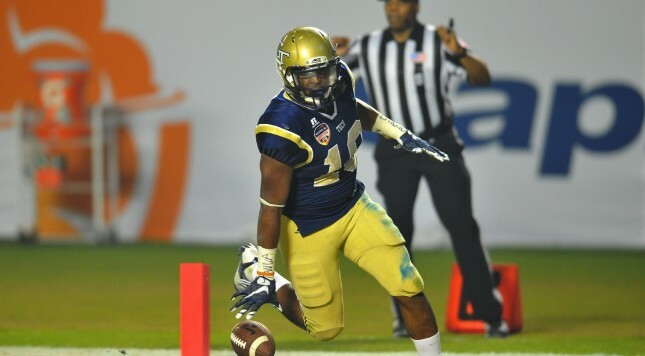 However, Georgia Tech was the squad that looked like it should compete for a national championship in this contest. While the game remained close in the first half, the Bulldogs simply had no answers for Paul Johnson’s offense. Whether it was Synjyn Days on the ground (171 yards, 3 TDs), Darren Waller catching passes (5 catches for 114 yards and a TD), or Justin Thomas doing a little bit of everything (7-12 passing for 125 yards, 14 rushes for 121 yards and 3 TDs), the Jackets moved the ball at will all night long. In fact, the offense was so effective that it scored on five straight possessions from the second quarter until midway through the fourth quarter. Of course, it was evident early on in the second half that Mississippi State wasn’t going to be able to stop the Georgia Tech offense. Why else would Dan Mullen have opted to go for it on fourth-and-21 from the Jacket 36 down 28-20 early in the third quarter unless he knew he had to have a score in order to remain in the contest? If he’d had any confidence that his defense could get Tech off the field, he would have punted the ball in the situation to begin the next drive with excellent field position. Yet, he didn’t, which speaks volumes about how explosive the Jacket offense was. Although the offense will receive most of the credit for the victory, the defense deserves a shout out for its performance on Wednesday night as well. Sure, it allowed 605 yards of total offense, but the numbers don’t tell the entire story. Despite the high yardage totals, the Jacket defense came up big when it mattered most, stopping four promising Bulldog drives in Tech territory (3 turnovers on downs, 1 fumble recovery). Not a bad outing against an offense that came into the game ranked 9th nationally in total offense and 14th in scoring. When you couple the stellar outings on both sides of the ball, it’s easy to see why Georgia Tech should finish the season in the Top 10. While some of the victories wouldn’t earn style points under the “controlling the game” nonsense metric the Selection Committee wanted to use, the fact is that the Jackets completed the 2014 campaign as one of the hottest teams in the country, defeating two top 10 teams in the final three weeks of the season.